One morning last week while I was stirring in bed, knowing that I had to wake up soon, something really weird happened. I heard the pop of the light switch in my bedroom and saw the lights go on. In a dazed state of mind, I called for my fiance, who was lying right next to me in bed, as was the dog. Now, I’m not one who strongly believes in the paranormal. I do think it is possible that spirits exist, but I don’t think there are all that many hauntings as some may claim there are. 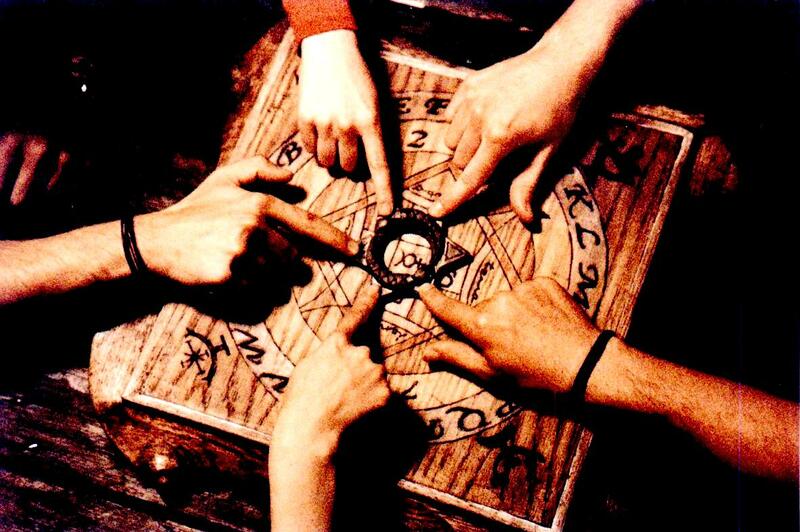 I remember playing Ouija as a kid and Light as a Feather, Stiff as a Board. I even went through a phase where I studied and “practiced” Wicca. So clearly I did have an interest in the topic when I was younger. But as I got older, I guess I became more of a realist. But on this morning, I almost became a believer. For the next hour I was laying in bed trying to figure out what could have been the cause of the lights going on. Was it a ghost? Was someone messing with the electricity? I got out of bed to go to the bathroom, and to check out the apartment to see if anything else was out of place. I was prepared to face whatever I saw. But everything seemed fine, so I got back into bed and thought about looking into the history of my apartment building. Did anyone die there? In all the years I have lived here why would a ghost suddenly show up now? What did this mean? I wasn’t scared. I was just curious. But the mystery was solved when I finally got up. It turns out that the cork-board that is on the wall with the lights happened to start falling off at the perfect angle to knock the light switch up, thus turning on the light. There was no ghost. I couldn’t help but laugh at myself for reacting the way that I did. What kind adult in their right mind jumps directly to the conclusion that there must be a ghost in the house? One who was lucky enough to be able to reignite an imagination that is often forgotten or ignored in adulthood, if only for a moment. Back home now and starting to get back in the swing of things. I know there’s some serious stuff I have to refocus on — the other aspects of my job that are not conference related and preparing for life without my boss; buying a new car before my inspection is up in September; and planning my wedding, just to name a few. But before I can even think about any of this, I have to get used to the day-to-day routine. I MUST get back to the gym, I have to get used to commuting again, and I really need to start eating better and sticking to it. But not everything has to be so serious and adult. That’s why I’m actually not going to blog about my return today. Instead, I’m going to blog about an interesting phenomenon that effects children, and adults alike — things that glow in the dark. I can still remember having glow in the dark stars on my ceiling as a kid, and a black light when I was a teen. I had glowing bracelets and glow sticks. My friends had lava lamps and we all wore hyper color shirts. Glowing in the dark is something that remains cool as you get older, and I feel like the reaction to glowing is basically the same. It’s the surprise and awe, the trick that light plays on one’s eyes. When I was in Puerto Rico a few years ago with the then-boyfriend, now fiance, we were thinking of going on a Bioluminescence tour in the bay. They take people out in canoes at night to the bay. When you get in the water, organisms react by glowing. I really wanted to see the creatures that glow in the night but there was no guarantee that the organisms would come out that particular night. We didn’t end up doing it because it was a pretty penny for something that wasn’t a sure bet, but the island sure made money off of adults wanting to see living things glow in the dark. I love how the delight over glow in the dark hasn’t faded with technology, or in my sake, with age. How’s that for a light-hearted post?